The summit is a folding knife with a couple of extra tools created mainly for campers but also useful in urban environments. The knife is a liner locking folder with a 3'' modified clip point blade, half serrated made of 420H steel. It offers thumbstuds to open and locks in a secure way. We found it good enough for normal cutting jobs with good edge retention and sharp from the factory. The grip is very good due to the shape of the handle with a generous area to rest your fingers, the inlays in the handles make the grip secure and non slippery. At the back of the knife you will find a very generous lanyard attachment point and two small tools with their own thumbstuds. One is a can opener and bottle opener combo that can also be used to clean nails and minor cutting jobs. The second tool is a screwdriver that can work on both flat and philips screws. Both tools work very nicely and are well built. The last tool in the Summit is a corkscrew, that in our modest opinion is a little hard to explain combined with a knife. Some other tool would have made more sense, anyway if you need a corkscrew this one works in an acceptable way. 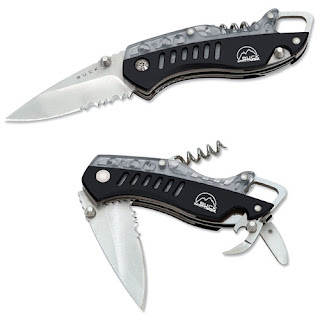 The Summit is a good knife interesting if you go camping or as a multi use tool, it doesn't have a pocket clip and the corkscrew is not very useful, if you can deal with those problems then the rest is really very good. You can read more from Buck's website or order from BaseGear for $55. This is a new version of the Surefire G2 using a SSC P4 LED instead of the incandescent lamp in the regular Surefire G2. With the LED the G2 can produce up to 80-90 lumen and the runtime is 12 hours, the light is not regulated so the light will get dimmer as the batteries are consumed. It uses two c123 primary batteries. The body is made of Nitrolon polymer, extremely strong and resistant to all sorts of impacts and falls. The lens is polycarbonate with anti reflective coating. The switch is a tactical lockout switch, you can press for momentary activation or twist for constant on, untwisting the tailcap a few turns locks the light to prevent accidental activation. The beam is a good combination of throw and flood, the reflector is textured to make the beam of the led smooth without artifacts, this means the throw of the light is slightly compromised to make the beam more even. Compared to the incandescent version this throws less but produces more light in total output. 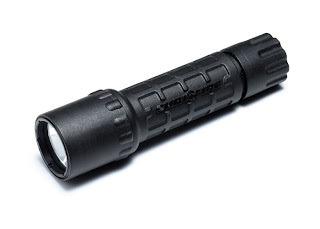 With a very long runtime the G2 is a good all-around flashlight that needs very little or no maintenance at all, it never needs a new bulb and can run for many hours with one set of batteries, the beam is good for indoor or outdoors use. You can read more at Surefire's website or order from OpticsHq.